As dog owners, we are not strangers to the idea of dog ramps. They help our canine best half overcome distances, reach different places quickly and have a comfortable time finding their way through a world that’s designed for humans. Essentially, dogs are perfectly capable of overcoming these challenges on their own, without any assistance from us. However, they would have to sacrifice their comforts and at times their physical health to get through these places. Dogs have to balance their bodies so that they don’t fall when alighting from a car and they have to take caution not to drown when getting into a pool. These are not easy task for senior or hurt dogs. The concept behind dog ramps is to make it easier for dogs to reach different places without having to wear out their joints. Regardless of what your reason for getting a ramp for your dog is, it’s essential to identify the ideal indoor and outdoor ramp to meet your puppy’s need as well as your budget. One outstanding feature of this ramp is that it is versatile for use on both dry land and in the water. This is so evident in that although it is marketed as a general use dog ramp, it has hooks, holes, and slots that make it easier to attach it to boats, pool sides and piers. The ramp is ideal for owners who have medium and large dogs and those on the heavier side too. The ramp is strong enough to accommodate a weight load of 500 lbs and wide enough to take in a large dog. A significant feature of the ramp is that it is foldable; making it easy to use and transport. 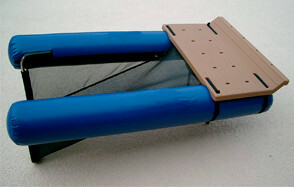 The material used to make the PetSTEP Original Folding Pet Ramp is advanced composite plastic. Therefore, it is flexible enough to handle the pressure and tension exerted on it by massive dogs. It is also lightweight. The ramp has a soft, non-slip walking surface that gives the dog a good grip in both dry and wet conditions. The ramp is designed to fit both the comfort of the owner and the dog. The grips and handles are molded in an ergonomic shape, thus making them more comfortable to transport and use. The support feet are made using dense rubber; a material which gives it enough grip and lots of stability. So, you won’t have to worry about its stability. The grips and handles are made in an ergonomic form, thus increasing their comfort. The Solvit PetSafe UltraLite Bi-Fold Pet Ramp is lightweight and durable. Treat your pet to walking up and down the ramp until they are comfortable walking into cars or raised places for SUVs, trucks and other places. It enables puppies to go up and get down without stressing their joints. Considering its low cost, you are likely to not find a better light-weight model in the market. Finally, our dogs can experience guaranteed footing because of its high traction walking surface that offers a non-slip tread which is easy on the dog’s paws. The ramp has four rubber feet, which give it stability. The raised rails on both sides make dogs confident as they walk up and down the ramp. It features a built-in safety latch, which secures the ramp during transportation. The Solvit PetSafe UltraLite Bi-Fold Pet Ramp is ideal for smaller pets, pets recovering from injuries and for older pets. Buy the ramp if you don’t want your pet to suffer injuries as it climbs or goes down high surfaces. This is more of a platform than a ramp. It is made using lightweight but sturdy aluminum and is coated to prevent rust or corrosion. It is 20 inches long and fourteen inches wide, making it ideal for dogs of all sizes and weight. It features traction ridges on its surface to ensure that the dog has footing while walking on the platform. There are security straps that are linked to the platform diagonally to lift the frame to protect it from falling. One advantage of the platform is that you won’t have to deal with actual bolts, pins, and screws when you are installing it. This means that you won’t have to compromise the platform’s structural integrity of the ladder. If you are looking for a floating dog ramp, then you should get the Dog on Water Ramp. The ramp is ideal for small, medium and large dogs that don’t exceed 100 pounds. Considering that it is a floating ramp, you won’t have to place it over a dog boat ladder. It means that you and your dog can come in and out of the water without having to attach the ramps constantly. It actually looks like a small pontoon boat because it has two buoyant tubes at its sides which help it to float. It also has a middle construction that your pet can swim right up onto. This is one of the best dog boat ramps. When setting it, you will have to dock lines similar to those of the ramp to help guard your boat. You also have to inflate the tubes for use. After you set it up, you don’t have to do anything else during the entire boat trip. Dogs require care and love, and a perfect gift would be the Solvit PetSafe Deluxe Telescoping Pet Ramp. It is convenient and lightweight, thus offering an ideal alternative to ease movement in and out of your car. If you are a lover of outdoor activities, you can bring your better canine half with you since the ramp will provide an easy way of moving your pet dog. It is suitable for use on any vehicle, regardless of how high off the ground it is. 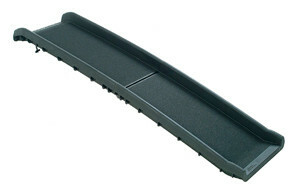 The ramp features raised guiding rails as well as an anti-slip surface to enhance grip. Therefore, the ramp is perfect for senior pets with mobility issues such as arthritis. Considering its ease of use, you can train your canine friend to walk in and out of the vehicle. You can regulate it efficiently because it is telescopic and won’t flex when spread out. The ramp is perfect for use by massive dogs that have undergone operation procedures since it comes with sandpaper finishing, which is excellent for your pet’s grip. Every dog pet owner wants to have a ramp that allows the pet easy access into the car and any other place. The Pet Gear Tri-Fold Portable Pet Ramp comes with superior features such as a removable mat for excellent grip and a latch to carry the ramp when traveling with your pet. The lock has made the ramp easy to transport and store because it uses less space than other ramps. 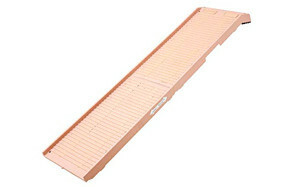 The Pet Gear Tri-Fold Ramp is firm and is of high quality. It is suitable for balancing weight and strength. If your dog is an active one, you should get this ramp. The removable mat is pressure activated. Thus your pet will grip easily onto the mat, by merely putting weight on it. The rug is preferred to other kinds of carpet treads since it allows your dog’s paws to have a more extensive surface area contact with this ramp. The result is better stability. Considering that the mat is removable, you can clean it with ease. The ramp’s features ensure that the pet doesn’t topple over. That way, the dog will not be scared to travel with you. Now that the ramp has bottom grippers and a safety leash, you can be assured that it will maintain a steady position. No more straining as you struggle to lift your dog into your car, pouch or even bed. The Perfect life ideas ramp is perfect for short legged and more massive dogs. The ramp his sturdy and light-weight, but it can support up to 200 lbs. You can use the ramp for senior and injured pets. Offer them the pain-free comfort they deserve during these trying times. Considering that the ramp is non-skid, you are assured of your pet’s safety. The surface is non-slip for better security. There is no better way of preventing wear and tear on pets than buying the Perfect Life Ideas Pet Ramp. It is constructed using aluminum and stainless steel. The materials make the ladder long lasting and durable, so you won’t have to be worried about replacing it. The arms are adjustable, and they are coated with rubber to prevent scratches and noise to the boat. Once you are ready to start moving, you can pull the ladder, fold it and throw it in the boat. It’s olive in color, thus making it blend well with water. The Drifter Marine Dog Boat Boarding Ladder will make you want to go swimming with your canine companion all the time. This innovatively created ladder features an adjustable foldable ladder which hooks effortlessly over the majority of boat walls. The ramp has adjustable leg standoffs, which make it easy to fit the ladder on the boat’s hull. It has rubber guards on the hooks, a feature that prevents the ladder from scraping the boat’s finish. The aluminum construction makes the ladder extremely strong and resistant to corrosion. The mesh netting that’s on the ladder offers your canine a slip-proof and safe surface that the dog can climb on safely. Both the climbing platform and the arms fold, thus making the ladder easy to fold and store. It can hold dogs with as much weight as 125lbs, so it’s suitable for massive dogs. Boarding and alighting cars can leave a lasting effect on your pet’s health, particularly the limbs and joints. Keep your pet healthy with this ramp, and get to enjoy your better half canine’s company for a long time. The smart dog ramp is ideal for large dogs. It ensures safety, ease-of-use, and versatility. Now, dog owners do not have to continue dealing with a host of jumping damages such as joints, hips and the backs. Above all, pets feel confident when on the Solvit Smart Ramp because it’s footing is made from OSHA-approved materials. The ramp has an amazingly sturdy frame that is as tough as fiberglass ladder. Therefore, your dog will not slide, slip, sway or bounce while on the ramp. It is carefully designed to protect your pet’s paws as well as the pricey car finishes from scratches. Before you start shopping for a ramp, consider your dog’s weight and size. Ramps come in different sizes, and each can carry only a specified weight. Once you understand the characteristics of your dog, you will be able to narrow down your options. Where will the ramp be used? The second consideration is where the ramp will be used. If you want it for a pool, you should get one that doesn’t take up much space. Also, find a ramp that will mount well on the surface of the place you want to use it. Some systems are designed to be easy to set up and to use. However, others are made to be permanent. Therefore inquire from the seller how the ramp should be installed and figure out how easy installing it will be. Your dog might fall a few times when learning how to use the ramp. That is why you should make sure that the exposed surfaces are smooth and not likely to cause injuries. You might have to move the dog ramp frequently for various reasons. For instance, if you are using it on a boat, you might have to fix it on different boats in different locations each time. That is why you need to buy a dog ramp that can be moved effortlessly. Smaller dogs usually have difficulty getting in and out of taller cars, while larger dogs are often reluctant. Folding dog steps can make things easier for all kinds of dogs, including those which might be scared of heights. No more lifting your dog. Lifting dogs might be dangerous for both you and your dog. Thus, using a dog ramp is to your advantage as well. Dogs can easily get injured as they are boarding or alighting from vehicles, mostly when it’s snowing or raining. Get a ramp with a grippy surface so that you lessen the risk of injury and keep the dog healthy. Ramps help in preventing joint problems and injuries. Therefore, they promote the health of the puppy and ensure they live for a long time. A pet ramp may be used for more than cars only. It is portable and lightweight, meaning that you may use it even on boats, beds, and couches. Just like any other item, ramps should be maintained if you want them to stay in optimal working condition. After use, make sure you fold it and store it properly. When you get home, clean your ramp using a pet-friendly detergent. Do not keep it within reach of pets and children because they might play with the ramp and damage it. You May Also Like Our Review of the Best Dog Ramps. A: Ramps come in varying sizes. The ideal size of the ramp relies on the size of our dog. When buying a dog ramp, take the dog’s measurements and ensure the ramp you buy fits your pet. You should also consider the weight that the ramp can carry, against your dog’s weight. The ramp should be more extensive than your dog and able to bear more weight than your dog’s weight. Q: How do I install it on a boat? A: Again, the installation procedure depends on the manufacturer’s instructions. When buying a dog ramp, remember to ask for the installation manual. However, there are three primary ways of installing it. The peel and stick – Some ramps are made such that they have a sticky surface. Remove the stick-on and attach the dog dock ramp on the boat. The glue lasts for a while, and after a few installations, it might become weak. However, one can use glue to enhance its stickiness. Using ropes – you can use a rope on either side of the mat to attach the ramp to the boat. On both sides of the boat, weave the rope between the holes on the mat and fix the carabiners to the rope and then to the boat. Permanent fixing – you can also fix the ramp permanently on a boat. That way, you do not have to attach and detach the ramp every time you want the dog swimming. A: The durability of the dog boat ramps depends on the material that has been used to make the ramp. If you are using the ramp on a boat, make sure it is coated with aluminum or any other anti-rust compound to ensure its longevity. Q: How do I train a dog to use dog boat ramps? A: While some dogs simply walk up the ramp, others have to be trained to use it. When training your pet canine to use a ramp, you should start slowly. Even though your dog is a fast learner, start off gradually just in case the ramp is the one aspect that freaks him out. If your dog is food motivated, place a treat next to the ramp. This way, you will be creating a positive association between him and the ramp, so he will believe that positive things happen when he’s near the ramp. Try this trick a few times, and if he responds well, you can now set it up on a gentle incline. You can increase the slope gradually until the puppy walks up the ramp happily. As the incline gets steep, consider putting a trail of treats all the way up to encourage her to get to the top. Buying a ramp for your dog means that your pet will not require lifting when you go out swimming or for an adventure. If you want a comfortable and portable dog ramp, look no further than the PetSTEP Original Folding Pet Ramp. The best feature of this ramp is that it is versatile. Thus, it can be used both on dry land and in water. That way, you don’t have to buy two ramps. It is also sturdy, meaning that it is ideal for dogs of all weights. Considering that the floor is made using rubber, you are assured of the dog’s stability. The PetSTEP Original Folding Pet Ramp is foldable so that it can be transported and stored easily. At the end of the day, the happiness of your dog is what matters the most, so make every moment with your puppy a treasured one by buying the PetSTEP Original Folding Pet Ramp.